Specializing in tree surgery but providing expertise across a broad range of land related services, T4S work with both residential and commercial customers. From grass cutting and landscaping to woodland management and tree surgery we always aim to deliver our service to the highest possible standard. Our bases in Edinburgh and Glasgow provide us with the platform to operate across the central belt and further afield. T4S teams have even been spotted as far north as Wick and as far south as Palnackie in Dumfries and Galloway! Over the years we have built up a good network of local suppliers in various parts of the country ensuring that our customers always get good value for money. We are happy to hear from you no matter where the job is located. We provide an excellence in tree care management from arboricultural pruning to arboricultural dismantling, with friendly, knowledgable and expert tree surgeons using state of the art Stihl machinery. Based in Lochwinnoch, near Glasgow, we provide professional tree surgery and tree felling services for domestic and commercial clients. We offer a friendly service to all of our customers and endeavour to leave the site tidy after work has been completed. All jobs large or small are completed to a high standard. We understand the importance of keeping your trees safe and healthy. NPTC qualified and fully insured, with public liability insurance for up to £5million. Welcome from Sale Tree Surgeon. We are one of the leading tree surgeons in Sale, Cheshire and Manchester, with numerous years experience in carrying out all types of tree services. Sale Tree Surgeon are one of the leading tree surgeons and cover areas throughout Sale, Cheshire and the whole of Greater Manchester. We have a number of years worth of experience carrying out all kinds of tree work, including tree felling, pruning, crown reductions and general removal of both tree and garden waste. Our tree surgeons are well qualified to complete jobs with both the health and aesthetics of the trees at the front of their minds. So whether you require a tree service on a residential or commercial property, Sale Tree Surgeon will be able to assist you all year round. Basic tree surgery involves pruning trees that have overgrown; cutting down branches that are dangerous or growing too high, far or wide; or shaping the whole tree. 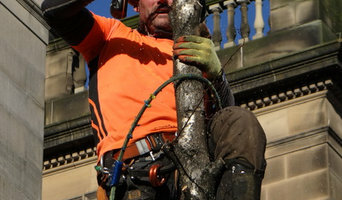 However, many tree surgeons in Glasgow, Glasgow City can carry out a number of other tree services, including tree planting, felling whole trees, trimming hedges or large plants, tree stump removal and even installing tree lights. Arborists will be more technically trained and can diagnose tree diseases as well as advising on how best to prune and maintain your trees. Unfortunately, trees don’t grow overnight but instead need a bit of lasting care and attention. To make sure they get the best start, ask a Glasgow, Glasgow City tree surgeon if they will carry out tree planting for you and give you advice on how to look after your new saplings. Arborists should definitely be able to do this, and most tree surgeons will too, but not necessarily so it’s always best to check before on the exact tree services they offer. Arborists will also be able to advise you on where to plant your trees and whether you have the suitable ground soil for them. Whatever your tree care problem, you can find Glasgow, Glasgow City tree surgeons and more tree services on Houzz to help you. If you’re planning on landscaping your garden as well as adding some trees, then you should talk to gardening professionals at the same time as tree surgery specialists. Here are some related professionals and vendors to complement the work of tree services: Landscape Contractors, Landscape Architects & Garden Designers, Garden & Landscape Supplies. Find tree service professionals on Houzz. Look in the Professionals section under Glasgow, Glasgow City tree services. You can look through arborists’ and tree surgeons’ portfolios and read reviews to see what past clients have to say.